Many of you have probably seen these machines, some of you probably use it on a regular basis at work or at home, and others have most likely at least heard about it. Keurig is one of these companies that make single-use pods for caffeinated (mostly) drinks. You stick the cup in the machine, you press a button, and out comes a cup of whatever it is that you were promised. Sounds good enough? I remember we had one of these almost 15 years ago at my workplace then, when these were still pretty novel. I never used it, of course, because back then the selection was almost entirely coffee. Nowadays they have everything you can name, and are much more common than before. The other big player in this market is Nespresso, of course, which is more common in Hong Kong but based on more or less the same idea. This machine you see here was in our hotel room on a recent trip we made back to North America. Among the cups we got in the room were the above two – a Tazo Awake tea (basically an English breakfast blend) and a Celestial Seasonings Antioxidant Green Tea. In the name of science, I had to try them. Brewing the tea was of course pretty simple – you stick the cups in, you put water in, you press the button. Then out comes the tea. The first thing you might notice from this picture is that the green tea is really, really cloudy, while the black tea was ok, for the most part. If you were there, you’ll also note that the green tea is almost entirely devoid of any aroma – you can barely smell anything putting your nose up against the cup. The black tea was a little better, with a smell that is recognizable as an English breakfast blend of sorts. The taste pretty much confirms what you can already guess – the green tea, if we can even call it that, was awful. The closest thing I’ve tasted that is like this is a really stale, really old green tea. It’s bitter, it’s devoid of any meaningful flavour, and it’s just…. plain nasty. I don’t discount the possibility that, in this small town hotel, the green tea has indeed been sitting around for a while. However, since they dropped off this pod at our request, that this could’ve been recycled multiple times also seems somewhat unlikely. The black tea was drinkable – it’s not great by any stretch of imagination, but it’s drinkable. If in a pinch, I’d be ok with drinking this. If your alternative is a teabag from pretty much anywhere else, the teabag will win. The body of this cup is also quite thin, with a weak aroma and a weird aftertaste. It’s not spit-it-out bad (the way the green tea is) but it’s not exactly a winner. I of course had no expectation of great tea coming in. You can pretty much guess this is tea of the nasty-grade variety. I was a bit surprised that the green tea is this bad – I expected something remotely drinkable, but instead got a flavourless bitter pill, basically. The leaves they use are of course teabag grade – you can see it’s the usual materials you find in teabags. I think the infusion method, which uses a drip-coffee style mini-filter, just doesn’t work for tea. 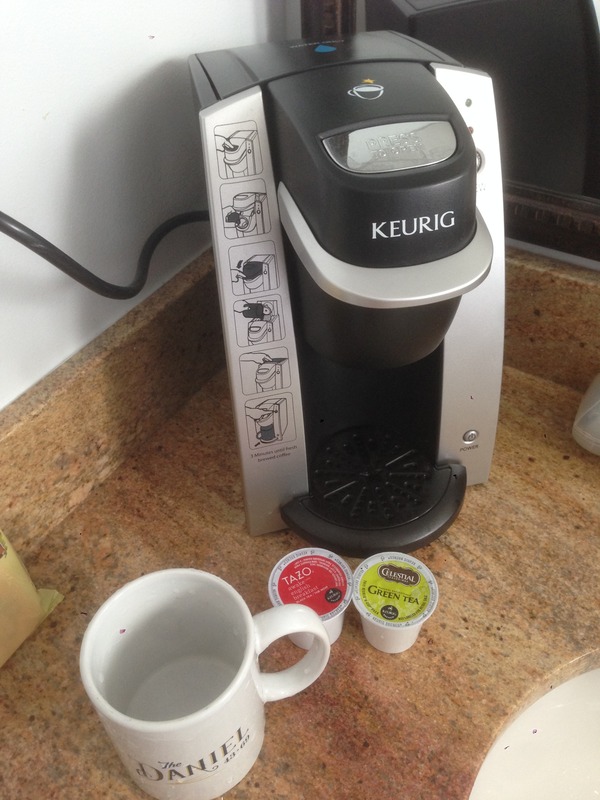 On the Keurig website, buyers have rated the Tazo k-cup a 5 star. The Celestial Seasonings green tea, on the other hand, is 3.5 star. As you know, a 3.5 star rating is pretty much crap in the online world. Glad to know the buyers are somewhat discerning. It’s no wonder that they need to add the word “antioxidant” in there – the tea is not going to sell itself. The thing that gets me about these things is cost. One k-cup will set you back about 90 cents USD per cup. In contrast, a teabag will be about 30 cents per cup if you buy one box, dropping to 20 cents if you are willing to buy in bulk (prices from Amazon). The green tea is a bit cheaper, but that thing shouldn’t be drunk even if it’s free. That means the k-cups are easily 3-4 times more expensive than the traditional teabag, yet it delivers a far inferior product. I would argue it’s really not much more convenient than a teabag either – unlike coffee, which is a bit of a pain to make on a per-cup basis, tea is actually quite easy to handle. In other words, get some teabags and stop paying extra for a terrible cup of tea. 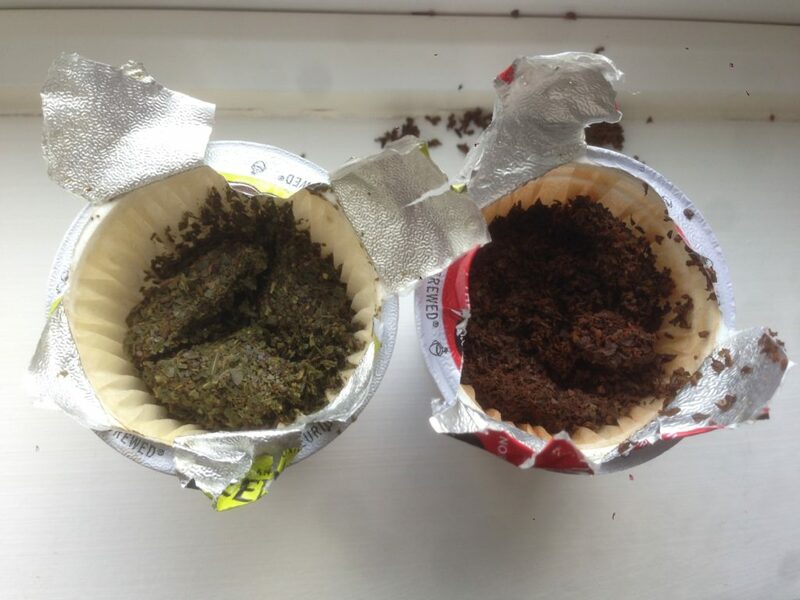 Also, we should mention that the teabag has much less ecological impact, since it can be composted, while the K-cup is plastic. And we should not forget about the Keurig DRM problems. Looks like the “green tea” I’ve had when other people have left teabags sitting around for a few weeks-months in the same packaging in which it was bought. On the first day of purchase, green tea bags are actually a little pleasant if you have a gentle hand. In this case I would assume the machine was very harsh, and the tea was more than a few days old. Green tea in this kind of storage goes to garbage pretty fast. On the other hand, black tea is pretty forgiving, and I’d gladly take a cup of something like the one posted above or another English blend given no other option. Can’t go wrong with a safe bag of black tea for a simple cup. Hell even the questionable CTC black teas at least feel like tea, despite their usually awful taste. Green tea like that though… No thanks. Very depressing stuff. 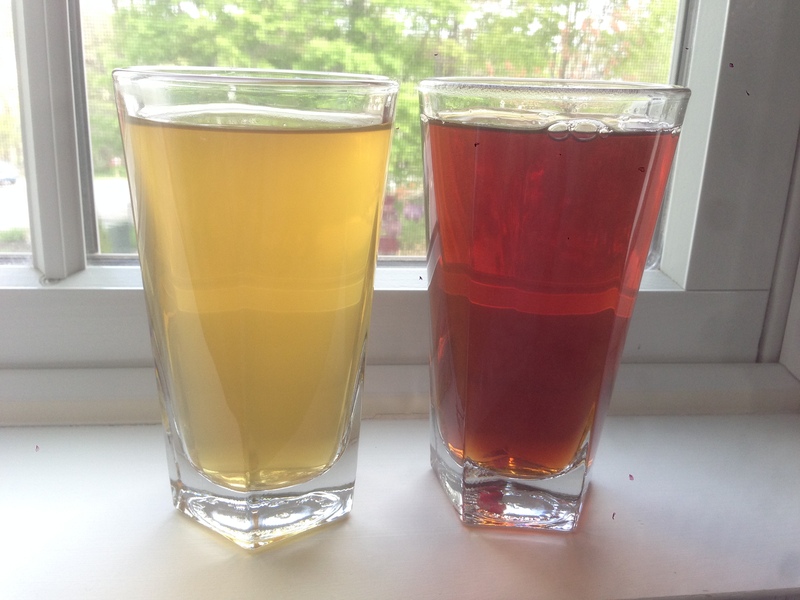 Perhaps we can even get into the topic of the quality of that hotel water.. Another thing that will spell disaster for any sensitive tea, but something a reliable breakfast blend can mask decently enough. I live in Washington, and I once stepped into a yogurt and coffee shop to ask for some hot water for my flask of grandpa’d dongding. There was no hope of redemption. I’m still surprised at how thick and chalky that water seemed compared to the water in my home. I think from now on I will sample the water first before asking for my fix. I think while the water is not great, it’s not horrible. The fault is really the tea – especially comparing the black and green. The green is undrinkable trash. As you noted, even green teabags are pretty iffy, but this just…. is that much worse, especially given the waste (plastic) and cost. Aye. I’ve seen similar looking infusions of questionable green tea and if appearance is enough of an indicator of quality in this case, it’s enough to make me weep already without even paying mind to the problems of the packaging. It almost feels abusive. Huh, reading my previous comment with refreshed eyes of a new day makes me realize that I went on a bit of a tangent. I didn’t even mention that yeah, the product seems doomed from the start. To clarify my point I was thinking along the lines of, it’s trying to be something like a teabag, I suppose, but at least a teabag can work and is relatively simple. This just doesn’t seem like it would ever work as well or be as practical even if the tea was not so horrible. The tea being horrible makes it even sadder. Though it might be partisan to say, brewing tea in this manner seems to be missing the point. I suppose that’s the result of incorporating tea into a device intended for the typical coffee drinking personality. The downside I think are well documented and we don’t need to go over it anymore. It’s the environmental cost that is most concerning – yet more plastic used rather unnecessarily. However, some may favour the convenience pods offer so at least the technology might encourage more to try and enjoy tea. Your thoughts remind me of Starbuck’s “Tazo Green Tips” green tea. Occasionally I got it when I wanted a hot drink. The green tea itself is just atrocious. The aroma coming up from the cup is like a pot of crabs or shrimp boling. Very crustacean-like. Flavorwise, it was very bad. The thing with green teas is there is not a lot of middle-tiered teas, in my opinion. Outside of good there is only aweful, inferior, and godawful – your palate really takes a whomp when overwelmed by a bad taste. In the “name of science” you are very brave drinking either of these and I commend you on your endeavors. Are you entirely sure the green tea is Camelia Sinensis in origin? Its vaguely reminiscent of yerba mate which might explain the bitterness as I’ve tasted grass clippings and they tend to be much sweeter in the brew. It would be interesting to identify the temperature of the water that is hitting both of these teas from the machine as I would imagine its somewhere in the 80-90 degree if they are also to be used for coffee, however it might be hitting it boiling which might also explain why the black tea is marginally better on the palate and why from memory my experience of coffee from such machines is also pretty poor. Its a shame that the selling point of these things, like with most of the similar coffee machines, is the technology not the product. For this very reason I invested in a travel gongfu tea set and a cheap functional gaiwan that will travel well in bubble wrap.